The Gateway Aesthetic Institute & Laser Center offers many treatments that soften wrinkles. The two most aggressive laser treatments are Laser Skin Resurfacing (often called a Laser Peel), and Ablative Fractional Laser Treatment (using CO2 lasers like the Fraxel Repair laser). Which treatment is right for you? It depends on how severe your condition and how much downtime you can afford. 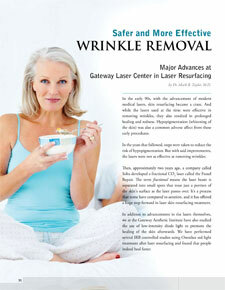 Click the icon on this page to read an article from our newsletter about wrinkle removal treatments. Also visit the related web pages listed here for greater detail about each treatment.